Let’s stay on the BMW builds listing. 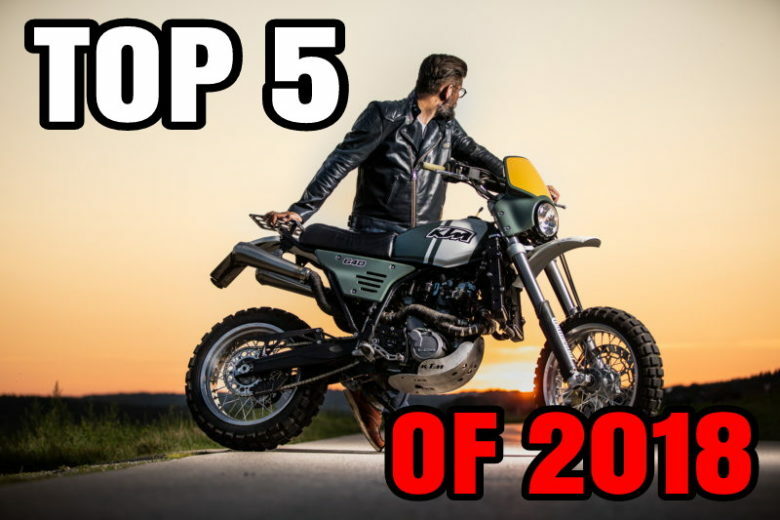 This time BMW R-series Top 10… A donor bike such characteristic and common, that You have a lot to choose from. There are literally hundreds of them. Personally, I’m not a big fan of this base since most of the builds are done using this huge and ugly stock fuel tank. 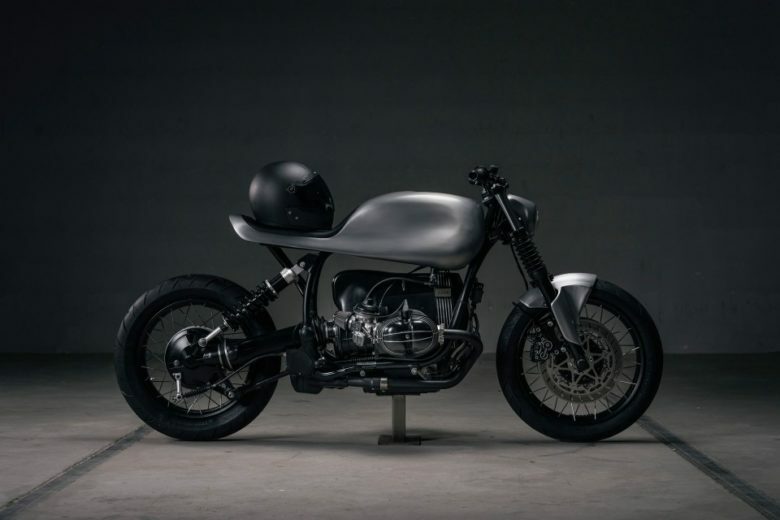 Or with the recent incarnation – the R NineT – in my opinion, they lost the way with the design. Still my favorite one. I don’t know if it’s because of the bright colors and styling. 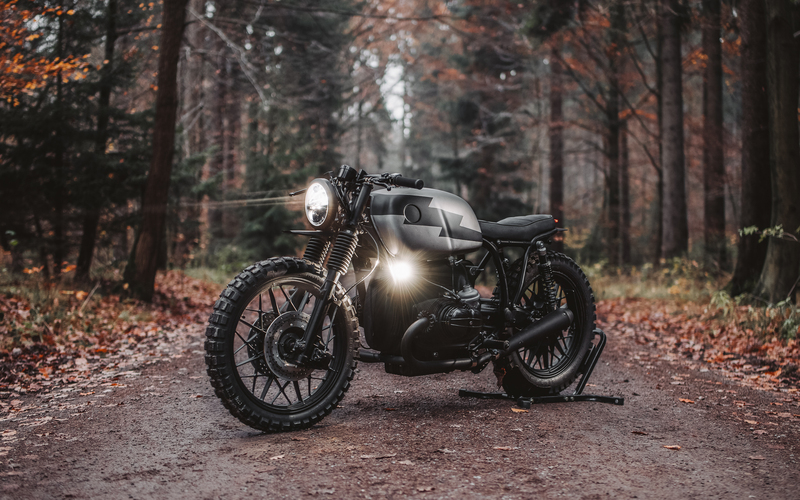 Doing the white frame, tires, headlight and even the forks… going crazy on making a minimalistic line, handlebars and controls… or is it just those sunny photos. Read more by clicking the link below – I’ve featured this build a few months back. This build was quite recently all over the web. I chose not to publish straight away since I found other builds better suited to my taste. But You can’t have an R-series Top 10 list without this one. 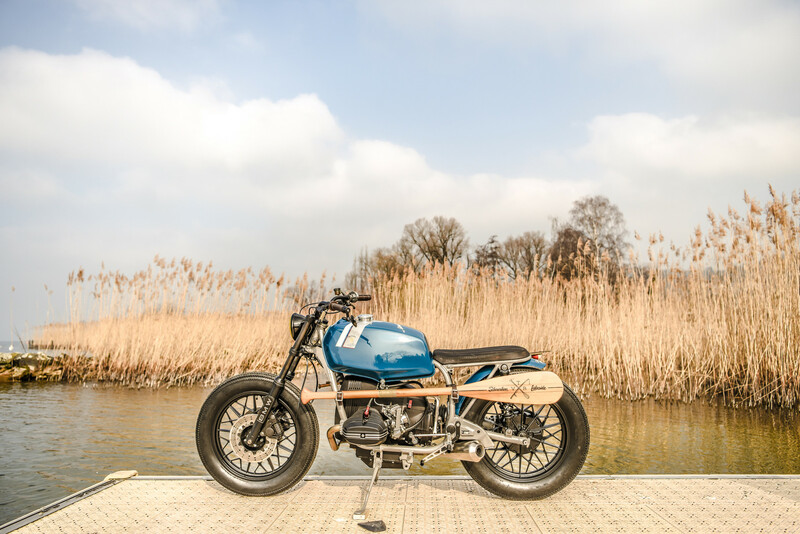 VTR Customs – are specialized with BMW. There are lots of them in their portfolio. But this is no ordinary build. Even for their high standard. 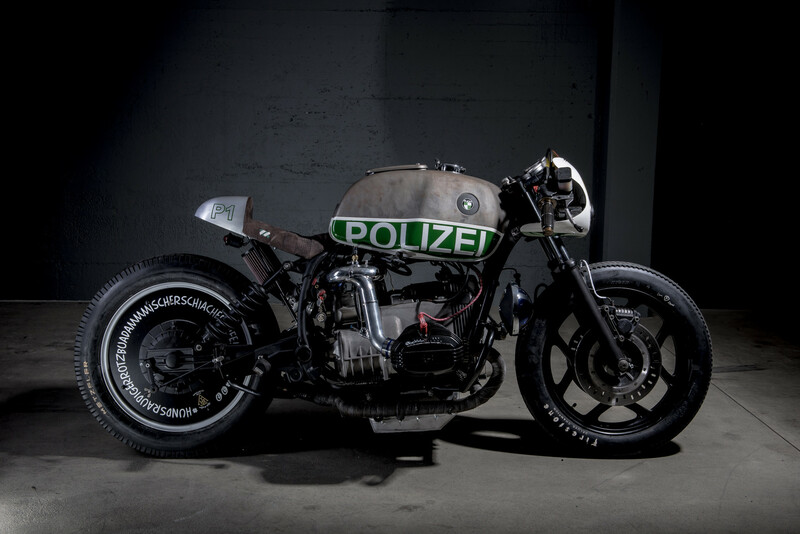 I don’t know what to think about mixing the “Polizei” name, with rusty looks… with a baby sucker and a medicine container, You can see in one photo (click the link below). Crazy build and I like crazy. This is some really interesting build if You take a closer look. Not only they rescued the line with the new tank but also took a great deal of attention to details and accessories. 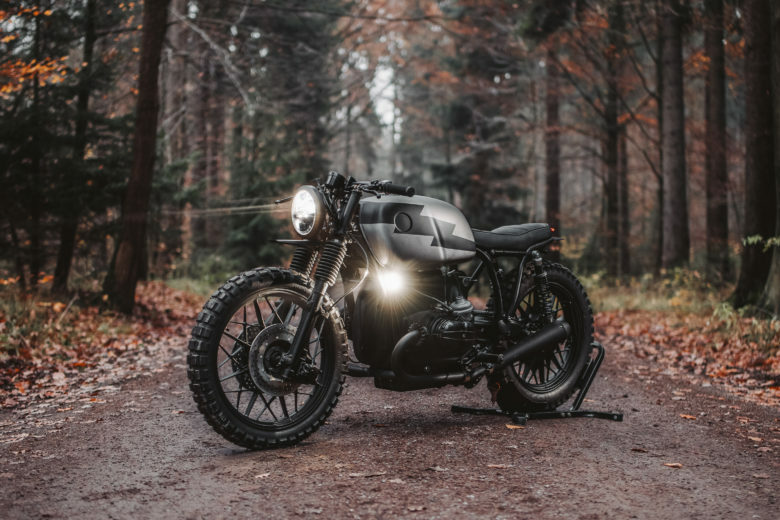 A great mix of modern touches with vintage styling, plus a black paint job… Can’t go wrong with that. This one, in particular, is the most “classic” one. I like the direction the builder took, to make it look retro. These flat-twins have this kind of aesthetics, that they look good when put into the 60s style as well as 80s or modern days. In this case – retro works well with some modern touches. Really discrete restomod. Let’s stay with a custom “restorations”. 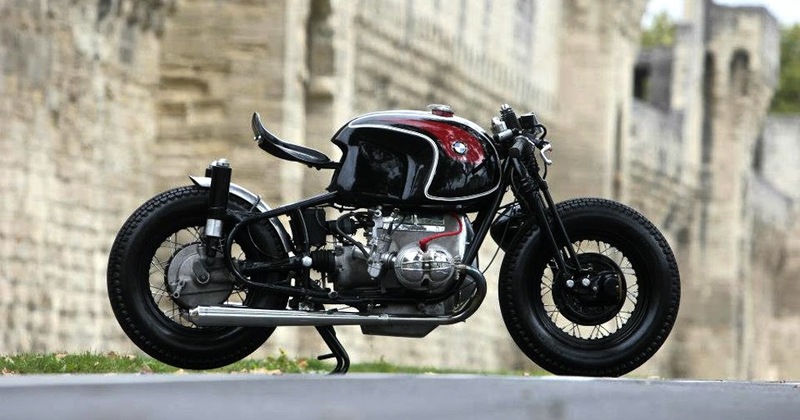 I don’t know if this particular transformation is more a restoration or a cafe racer. 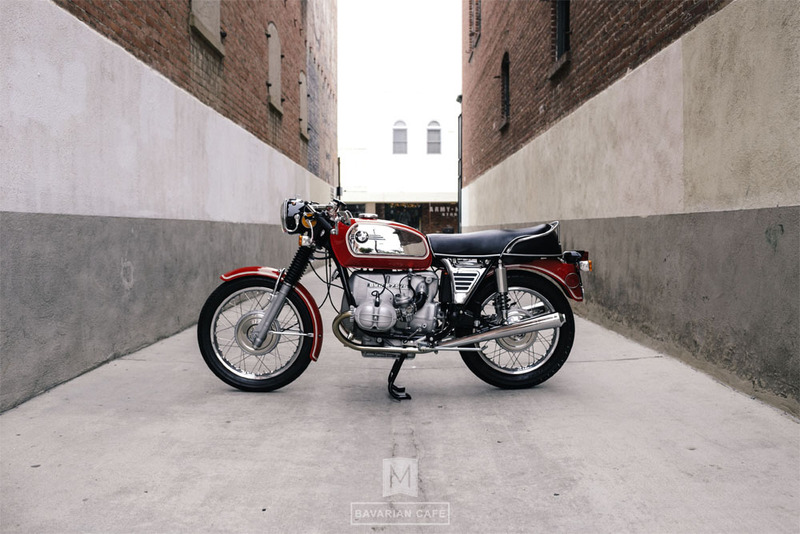 It’s a beautiful classic, an airhead engine with the chromed tank that looks perfectly 70s. 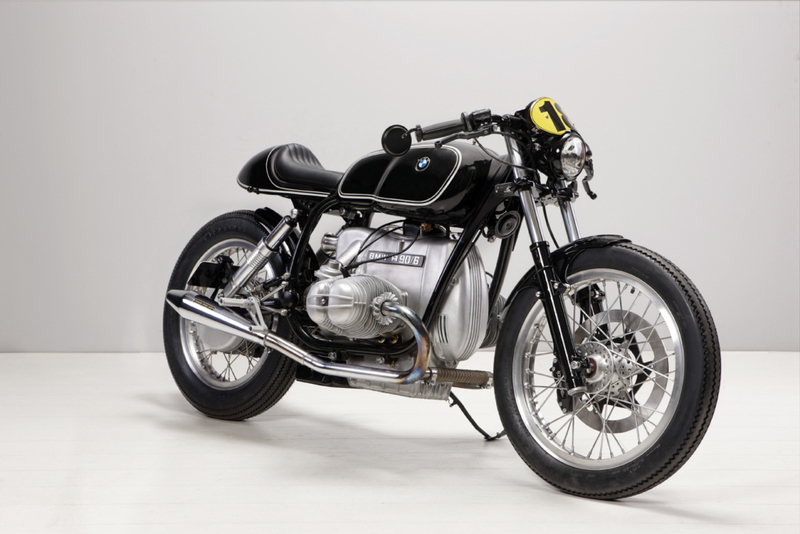 Tons of vintage details (handles for the passenger, bulky fenders… But with Cafe Racer handlebars and mirrors. 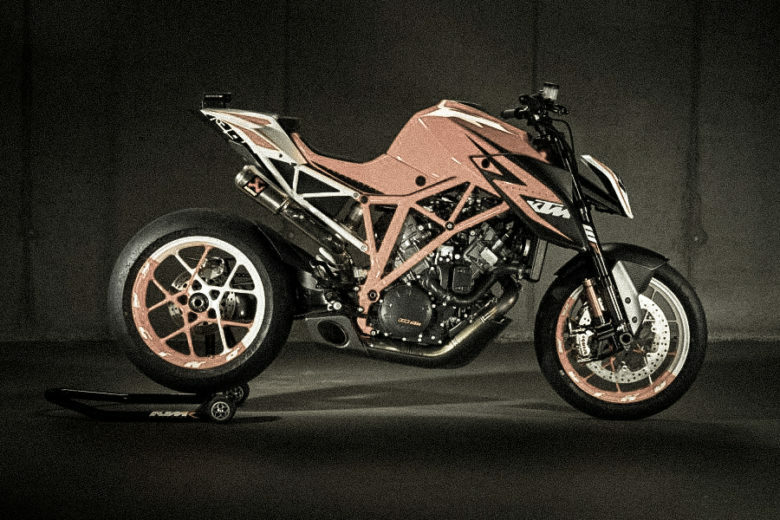 I don’t think the riding position would be anywhere near comfortable (since the footpegs seem way to forward), but this juicy red definitely looks stylish. And the whole thing works for me. This one was featured here over a year ago. It’s so ugly and different, that I loved it from the moment I saw it online. 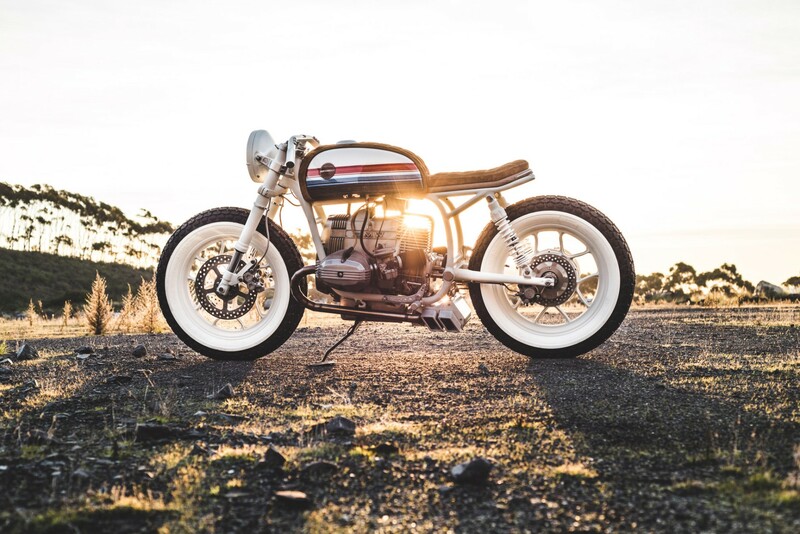 The forks, rear shocks, headlight, seat – are so unconventional. This fat tank… looks monstrous. Connected with this tiny, bobber like seat… Nothing should work here… But it does! It definitely deserves a place here. This one is a complete mix of styles. 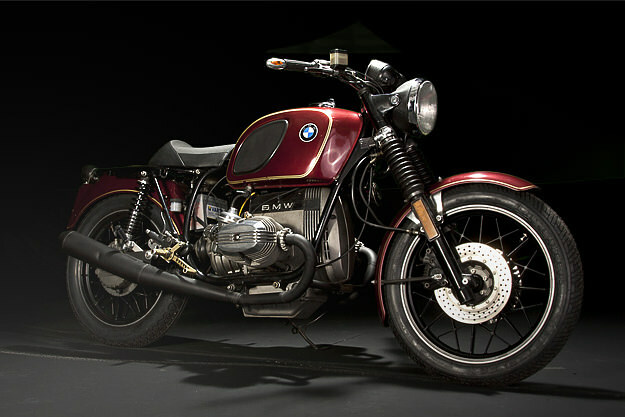 It’s based on 1978 BMW R60/7. 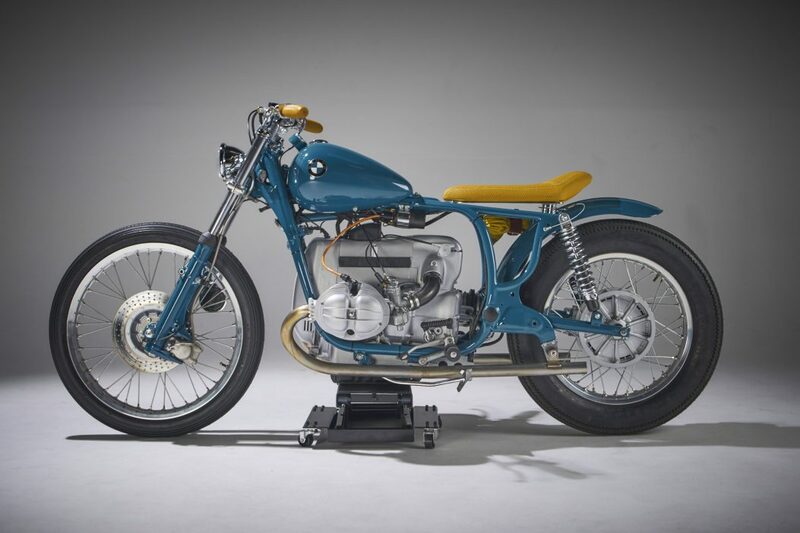 I especially appreciate the builder’s fantasy… You take a truly vintage bike and go crazy with colors. Mix it with some chrome and old-fashioned accessories. And then take a Harley Davidson tank and some crazy yellow fabric to finish the seat. Thumbs up for bravery on this one! Check out the full gallery under the link below – photos are really good. 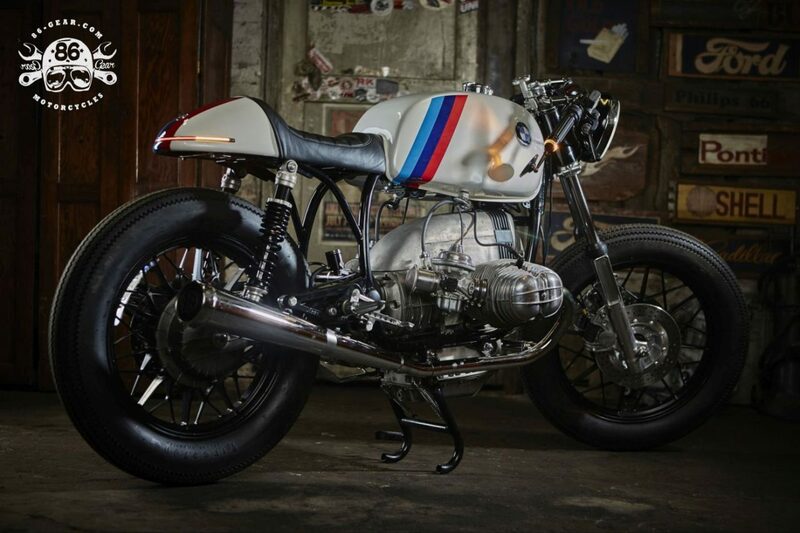 This one looks like an image for a definition of a BMW Cafe Racer. I had a chance to see it live on a motor show near Warsaw. 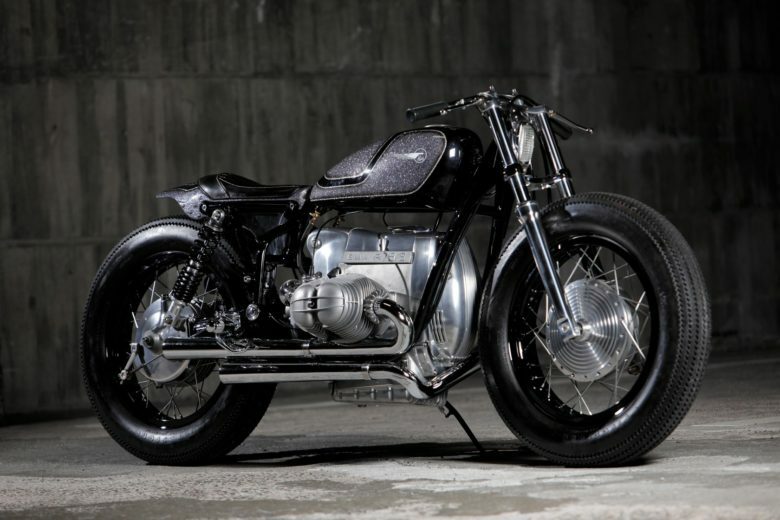 It was built by Christian from 86 Gear Motorcycles. A garage located 10 km from where I live. Really minimalistic build aimed to leave only what is necessary. Equipped with some modern electronic accessories – looks properly within the style boundaries. And somehow the awful tank doesn’t do it harm. 10. 1979 R100/7 “Hammerhead – Shark” by Hookie Co.
Hookie Co. is all about metal terror. Most of their builds are grey/black. Where grey is polished or brushed metal. And this build is no different on that. The intentional use of imperfections here and there and pure metal – fit’s the style. Turns out that the Japanese builds specialists are not afraid of German engineering. Plus: This is the only build that is standing on some off-road rubbers. And of course: this is no ranking. Just a list of 10 builds – no ordering by displacement, points or style.